1. Eldest son of Aaron and Elisheba; one of the leaders of the children of Israel who went with Moses to Sinai and "saw the God of Israel" (Ex. vi. 23; xxiv. 1, 9 et seq. ; Num. iii. 2, xxvi. 60; I Chron. v. 29 [A. V. vi. 3], xxiv. 1). Nadab was consecrated to the priesthood with his three younger brothers, but on the very day of his consecration he and his brother Abihu perished for having offered "strange fire" (Ex. xxviii. 1; Lev. x. 12 et seq. ; Num. iii. 4, xxvi. 61; I Chron. xxiv. 2). See Abihu in Rabbinical Literature. 2. King of Israel; son of Jeroboam; reigned over Israel two years. He was an idolater, following the cult established by his father, Jeroboam. He was assassinated by Baasha while besieging the Philistine town Gibbethon. 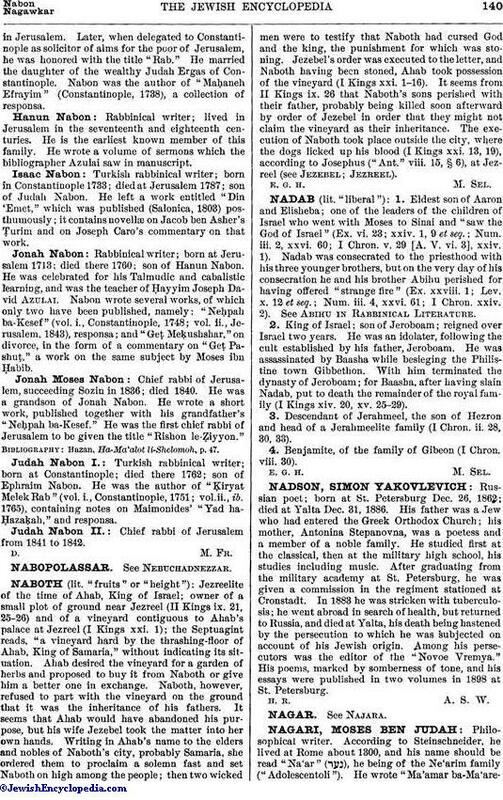 With him terminated the dynasty of Jeroboam; for Baasha, after having slain Nadab, put to death the remainder of the royal family (I Kings xiv. 20, xv. 25-29). 3. Descendant of Jerahmeel, the son of Hezron and head of a Jerahmeelite family (I Chron. ii. 28, 30, 33). 4. Benjamite, of the family of Gibeon (I Chron. viii. 30).